Vendor: IMSI/Design Sold by: Amazon Web Services, Inc.
Professional 2.5D CAD – That Works Like AutoCAD® LT - TurboCAD LTE Pro is a full-featured 2.5D CAD solution with advanced features and extensive file support. LTE Pro offers everything you look for in AutoCAD LT, plus additional advanced features that CAD professionals want, all at a fraction of the price. Low Learning Curve - If you’re already familiar with AutoCAD LT, the keystrokes, command line, intelligent cursor, and interface in TurboCAD LTE Pro make it easy to jump right in. 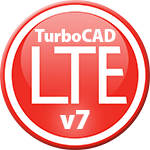 Enhanced Productivity - Load, process, and view even the largest CAD files using the 64-bit version of TurboCAD LTE Pro. Increase performance with the GPU-accelerated drawing engine. Better Drafting and Detailing - TurboCAD LTE Pro’s drafting palette, page layout wizard, PDF underlay, support for Xrefs, parametric parts manager, constraints, entity marks, and dozens more tools and features you won’t find in AutoCAD LT. Architectural Tools - TurboCAD LTE Pro provides architectural features you will not find in AutoCAD LT, including a range of parametric, architectural objects, a house wizard, and architectural style manager. High Compatibility with Other CAD Formats - TurboCAD LTE Pro makes it easy to maintain your intellectual property investment and share your work. LTE Pro users can open, insert, or view up to 35 file formats including DWG, DXF, SKP (Google™ SketchUp™), 3DM (Rhinoceros®), 3DS, IGES, STEP, OBJ, and COLLADA . Users can also export to over 25 popular design and CAD file formats. You will be charged $31.50 for each user assigned to the application.